Evergreen Landscaping Limited provides a wide range of landscape gardening services throughout the borough of Stockport and the surrounding areas. Does your Stockport garden need a serious make-over? If you've just moved in, or your garden has otherwise been neglected for a long time then we can help with a big clean up or makeover. We can undertake small-scale tree removals and other arboricultural work. We can trim overgrown hedges; repair existing walls, pathways, patios and decking. We can help transform the landscape of your garden! If your garden is ready for a major landscaping makeover then we can help you with every aspect of its transformation, from initial garden design advice, to the laying of new lawns, erection of new fences, construction of new patios, pathways, raised beds, garden walls, terraced gardens, raised decking structures and driveways. Whilst we can do pretty much any kind of hard landscaping work you may require, we are specialists in the construction of patios, pathways and drives using Indian Stone. 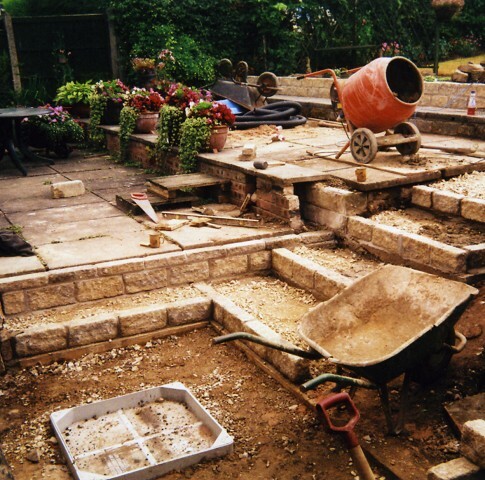 Whether you are planning a new feature or a complete garden makeover, please don't hesitate to call us today for a free, no obligation quotation, whatever your landscape gardening needs in Stockport or the surrounding areas.